The marketing arm of the European Handball Federation is looking for a new member for its team based in Vienna, Austria. 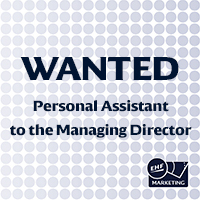 EHF Marketing GmbH is looking to expand its team and currently has a job opening for the Personal assistant to the managing director. Drafting correspondence, typing letters, minutes of meetings, emails, etc. Preparing papers & presentations for meetings, collation of materials, photocopying, binding, etc. Based in Vienna, Austria, EHF Marketing GmbH is the marketing arm and a subsidiary of the European Handball Federation. The company works closely with marketing and media partners, as well as with Europe’s leading clubs to realise the full potential of the sport on the international sports market. EHF Marketing GmbH is responsible for the marketing and media rights of club competitions including the VELUX EHF Champions League, Women’s EHF Champions League and the Men’s EHF Cup. Further information: eurohandball.com, ehfCL.com, ehfTV.com. Applications should be made in writing in English, with a current CV and a covering letter setting out why you would like to apply for the Personal Assistant to the Managing Director’s position.